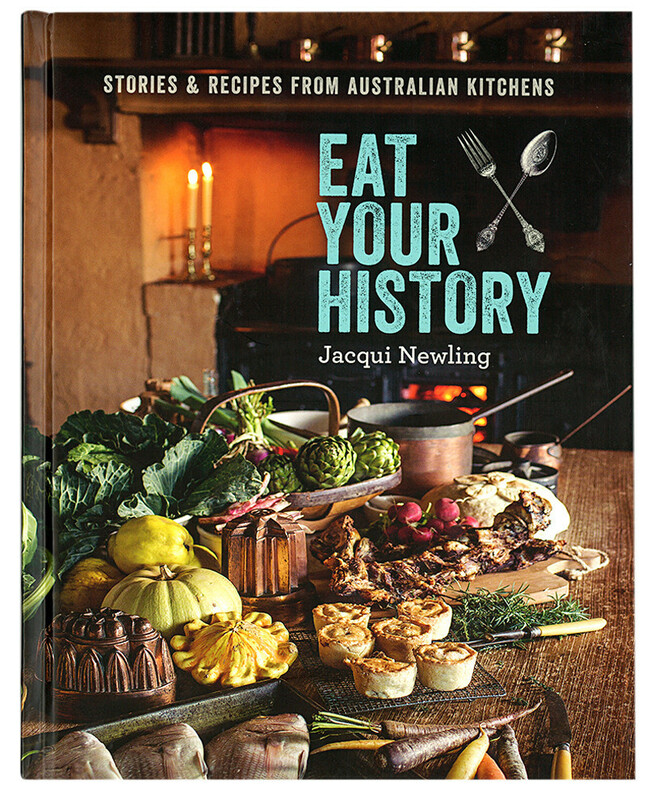 Eat Your History: stories and recipes from Australian kitchens is a wonderful, and very beautiful, collection of recipes, social history and historical insights. 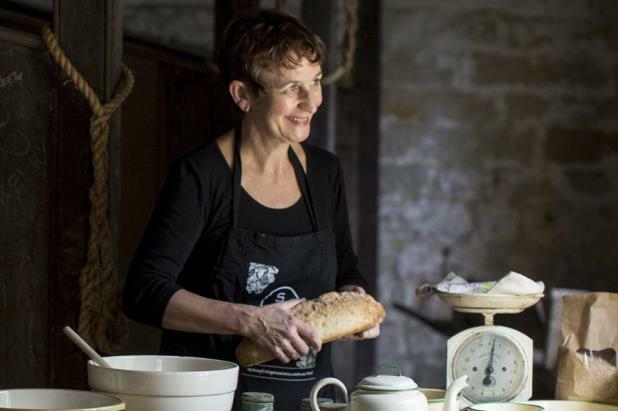 The stories have been gathered by Jacqui Newling, in her role as ‘resident gastronomer’ at Sydney Living Museums, which looks after 12 historic properties dating between 1788 and 1950. And, yes, one of those properties is Elizabeth Farm, the home of Elizabeth Macarthur. She gets quite a few mentions throughout as does the first Australian cook book (by Edward Abbot and which I blogged about in 2014). Australian garden history is a definitely a thing, with it’s own society and followers. Yet Australian food history still seems like unexplored territory. Jacqui Newling seeks to fill that gap, and does it extraordinarily well. Eat Your History is a lovely mix of historic depth and practical example, with a well-balanced mixture of prose, pictures and recipes. Readers are provided with historical context and background and then treated to fascinating recipes – each tested by Newling, and often using the kitchens and utensils of the period! Some are familiar, like the sea-food chowder and tomato chutney, others are less so, like oyster loaves or rosella jelly. I’m definitely no cook but some recipes even I’m itching to try, like Mrs MacLurcan’s Wholesome Summer Barley Water or Mrs Gaffney’s Date and Nut Cake. Eat Your History is a book for dipping into and it takes us all the way from the first fleet to the 1950s. Newling shares, for example, details about the nature of colonial kitchens, Aboriginal fishing practices, commercial ice manufacture, and dining room etiquette. A couple of weeks ago I was lucky enough to meet Jacqui Newling, in Sydney. I found her friendly, intelligent and forthright. She kindly agreed to answer a few questions for me. What was your writing process? Lots of research, then lots of writing? Or did you undertake the research as you went along? A combination of both. The majority of research had been undertaken over nine years, from my Masters in Gastronomy dissertation (University of Adelaide) and interpretation and programming at Sydney Living Museums properties. So the book was, in many ways, written in my head and poured onto the page (or screen) in an intensive four month writing period. Some additional research was then required as the content of the book rounded out beyond my existing knowledge. Apart from archival searches, how did you go about sourcing family recipe books? Any interesting tales to tell? Two Sydney Living Museums places – Rouse Hill house in Sydney’s north-west and Meroogal in Nowra – remained in their founding family’s hands over several generations; families that retained and actively used their predecessors cookbooks and recipes. We are fortunate to have these resources but also know quite a bit about the people who owned or used them, and the very kitchens, stoves and ovens that the recipes were cooked in are still in situ in the houses today. Girlie Andersen’s Golden Wattle Cookery Book (1947 edition), which her son Ernie continued to use after she passed away, was gifted to SLM when the humble terrace house they lived in at Susannah Place [The Rocks, Sydney] was preserved as a museum. In a world where cook books now occupy metres and metres of bookshelves in many households, the idea that a family might possess only one cookbook, and use it for thirty years, has a strong resonance for the way we value things today. How did you go about organising your research material? Do you use systematic files? Specialist software? Or are you more of a messy piles kind of person? I’m a bower bird rather than systematic, so myriad manila folders that flank my desk or digital files on my computer desktop, and numerous ‘notes to self’ sent as emails as I come across something useful. They are generally themed according to content – collected menus, recipes, stoves etc, by food type (usually related to gastronomy programs I’ve hosted) – meat, cheese, seafood, bread etc and sometimes by place – Wentworths at Vaucluse or Macarthurs at Elizabeth Farm, for example. Where do you write – do you need a special place or time? If so, I’d love a description! I work in an open plan office with some dynamic people who work on amazing exhibitions and interpretation projects, which is very stimulating but also very distracting. I knew I needed to create a writing ‘zone’ to totally immerse myself in, so my daughter loaded my iPod with mood music which I played on a loop (never on shuffle – that would require being conscious of the songs being out of their familiar order) through noise cancelling headphones. Even now, some 18 months on, I hear those first chords of the playlist and am transported into another headspace. I miss it actually – that intense subconscious activity. (The list included Active Child, Beach House, Bon Iver, Fleet Foxes, Radio Department – so quite contemporary). The book is very beautiful to look at – what was your input into the design process? One of the reasons for co-publishing the book (with NewSouth Publishing) was so we could determine the design content. Our designer, Anne-Louise Falson has worked at SLM for many years and created the design language for our Eat your history: a shared table exhibition (Museum of Sydney 2013) so had a good grasp of the flavour of my work, the audience we appeal to and importantly, our image archives. We worked very closely together on both projects, in consultation with fellow SLM curators, to ensure a balance of historical sources while maintaining a fresh and contemporary feel. What was the hardest thing about writing Eat Your History? The recipe writing and testing. Although I’m an avid cook, there is a huge responsibility to produce a recipe that will work for the reader. And for this book particularly, there is an obligation to remain faithful to the original source recipe. Yet due to the nature of them, often there is poor detail in the instructions (or none at all!) and inconsistent measurements, so they took several goes before they were perfected. The best? Working so closely and collaboratively with my colleagues and publisher on producing the book – I had an enormous amount of support with fact checking, proof reading, copy editing, image sourcing and permissions. Which is your favourite recipe, and why? It’s really hard to choose, but probably Edward Abbott’s ‘Fondu’, which is actually a cheese soufflé. It’s exceedingly rich, but easy to make – and it rises spectacularly! But it reminds us that foods aren’t always what we think they are, that terminology changes, as does spelling, but at the end of the day, ‘old’ food is still very relevant and definitely has a place on our modern tables. Where to from here? What does your next writing project hold in store for us? I continue co-authoring our blog, The Cook & the Curator with Scott Hill (who also contributed to Eat Your History) but my next major writing project is my PhD, on food and food security in the first British settlements in Sydney and Norfolk Island. It will take a lot longer than Eat Your History took to write, as I have to find time outside my work at SLM. But it will happen! Remove the lid from the bottle of vinegar and carefully prise off the ‘splash’ lid, if there is one. Drop the chillies into the vinegar and reseal. Leave to infuse for at least 2 weeks before using. The vinegar will keep for up to 12 months and the flavour will intensify over time. Adventures in Biography I have a young family and a demanding day job but in my spare time (!) I’m working on a biography of one of Australia’s first white colonists: Elizabeth Macarthur. So far in the course of working on the manuscript I’ve met some wonderful people and travelled to some amazing places. I thought it was about time to share the wonder and my amazement.